Custom drink cozies for cans and pint glasses that are great for gifts, events, weddings, parties, or decor. The cozies can be made from existing fabric, or use custom-designed fabric to get a truly one-of-a-kind look. Custom-designed fabric is a great option for your next event, wedding or party, or brand them with your unique identity. 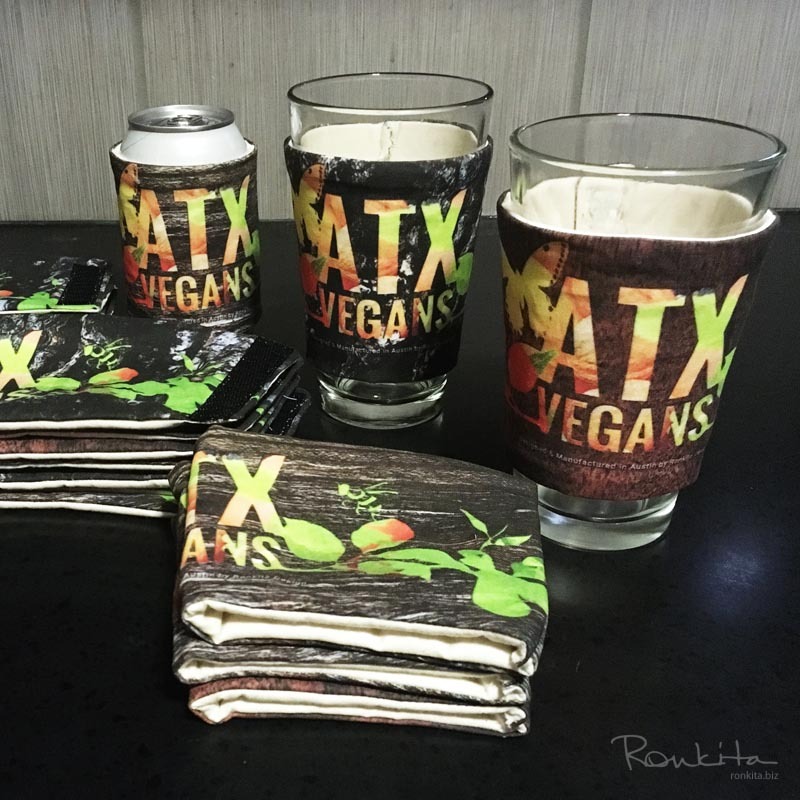 These premium cozies are designed and handcrafted in Austin, TX. They fit common can and pint glass sizes, and have unique features not found on other types of drink cozies. We specialize in custom sewing and design, and provide a wide range of services so you can get the personalized and unique items you want. Have your very own custom drink cozies created from the fabrics of your choice to get the personalized look you want. Use existing fabric, or have custom fabric created from your photos, branded graphics, logos, or artwork. Unlike other custom beverage coolers, these aren't simply a single or one-color graphic printed on the cozy. Instead, the fabric is the cozy, and when using custom-designed fabric, you can provide a much more engaging and unique experience. Provide truly unique and memorable gifts for weddings, parties, retreats, and other social events. Pair the cozies with drink coasters, table linens, bottle bags, decor in your home or restaurant, or even clothing. Provide a new way for your customers to experience, interact, and share your brand. Customize them further with options to use different colored fabrics for the inside linings, make the wraps reversible with graphics on both sides, or have messages included on the linings. Graphic design services are also available so you can get the exact look you want. Provide unique ways for people to engage with your brand. Drink cozies, table linens, and other custom sewn pieces are great promotional items that people can interact with and share. With branded and personalized graphics, these cozies provide a truly one-of-a-kind way for people to experience your brand. Use them for events, parties, corporate or client gifts, merchandise, and more - the options are nearly limitless when you have the opportunity to tailor them to exactly what you need. When creating custom pieces, we're a full-service shop that brings together a combination of sewing, branding, marketing, and design expertise. We can work directly with your design team, with graphic files you already have, or create graphics from scratch. With these full-wrap graphics, you're not limited to a small range or colors or sizes, and the design can be more than simply dropping in your logo. We have a wide range of experience and capabilities to achieve the design you want, and love working with others on crafting something unique. In addition to the option of using custom fabric, these cozies have a number of other great features. They fold flatter to carry them in your pocket or bag, taking up less space and with a smaller profile. When they get dirty, just toss them in the wash with your other laundry. They're more environmentally friendly than some other cooler products. We strive to integrate sustainable materials and processes into the production of the items we create. While these cozies don't have the same insulation properties as other common coolers, they can be more environmentally friendly. There are 4 types of cozies to choose from, for cans and pint glasses. Slides onto most 12 oz cans, and has a bottom to prevent them from slipping off. Slides onto most 16 oz pint glasses and is contoured to the shape of the glass. Wraps around most 12 oz cans, and is secured with VELCRO® brand fasteners. Wraps around most 16 oz pint glasses, and is secured with VELCRO® brand fasteners. * Minimum order: 18 pieces. Final price per piece is based on quantity, cozy type, fabric, shipping, and any other services provided. Getting your custom cozies made is a very easy process. Choose from the can or pint glass sleeve, or can or pint glass wrap. Use existing fabric or custom graphics. We'll help you determine the type of fabric that will be best for your project. For custom-printed fabric, we setup and manage everything needed to have the fabric created. You can use a single custom graphic for all of the cozies, or have a mix of different graphics. We'll work with you on selecting or creating the graphics, and also offer graphic design services if needed. The cozies are handmade in Austin, TX. Use and share your one-of-a-kind, custom cozies. Want to learn how to make your own cozies or sponsor a workshop? Check out the sewing workshop where you'll learn how to use a sewing machine to create the can wrap cozy. These are fun, relaxed workshops where you'll learn firsthand how to make these items. No experience, materials, or sewing machine required, just show up and leave with something cool. Contact us to learn more about sponsoring a workshop and using your own custom fabric. Need more custom items made? Custom-made stuff doesn't stop with drinkware! We specialize in custom sewing, making unique clothing, bags, accessories, décor, and even stuff for pets.